*A Plastic Sax tipster passed on a rumor that community radio station KKFI plans to reduce its jazz programming. I have absolutely no evidence to support this claim. *Pat Metheny's new trio effort Day Trip was released yesterday. Here's a live sample. And I just discovered that Pat streams his music at his site. Follow the "radio" links. *Joe Klopus profiled Stan Kessler's new band. *The Sun offers a piece on Candace Evans. *Seemingly apropos of nothing- a concept Plastic Sax fully embraces- a local television station put together a story about the Mutual Musicians Foundation. *The Steve Penn column mentioned here earlier this week also covers the long-awaited official opening of Harper's at 18th & Vine. *Two musicians who once backed Charlie Parker died recently. Bassist Earl May passed January 4. He was 80. Drummer Francis Clay died January 23. He was 84. *Fine Minneapolis jazz blog Bebopified reviews a recent Jazz At Lincoln Center Orchestra concert. Wynton's gang returns to the Folly Theater on February 8. *Some freak detected a strong jazz undercurrent at the Mars Volta's recent Kansas City concert. *Download graphic artist Rob Schamberger's take on the Mutual Musicians Foundation here. Kansas City has been called the place where jazz meets the blues. That relationship has taken an ugly turn in recent decades. The blues has pummeled jazz into submission. It's much worse than a black eye- it's as if jazz had its kneecaps broken and its tongue cut out. Blues' gains aren't necessarily jazz's losses, of course. But the blues is clearly dominating the battle to win converts. Just look at the stark contrast in attendance at shows, club listings, radio play and membership in the respective appreciation societies. It's no contest. That's all right- Plastic Sax loves underdogs. I could curate a site about collecting antique toenail clippers if I wanted to be more popular. These musings are inspired by Star columnist Steve Penn's passing reference to a blues club that's scheduled to open soon at 18th & Vine. It's tremendous news even if a note of jazz is never played inside the venue. The Blue Room, the Mutual Musicians Foundation and the two museums can only benefit from the presence of additional music lovers. Let's not put in that Do Not Resuscitate order just yet. 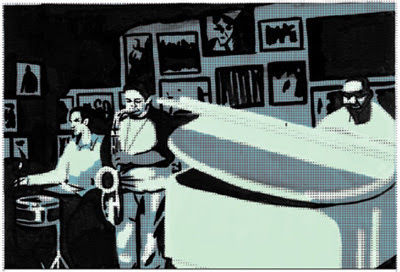 I can already hear many of you protesting that Miles Bonny isn't really a jazz artist. Maybe, maybe not. The semantics of jazz don't interest me much. Jazz, funk, whatever- the guy is getting it done. Area musicians should consider him a role model. He's internet savvy and cranks out videos and a steady stream of product on his own record label. It's time to step up your game, jazz cats. *Lee Ingalls put together a wonderful feature about Gregory Hickman-Williams for KCUR. His notes on the project are here. *The Star is host to a readers' debate about the Congressional earmark providing additional funds for the American Jazz Museum. *A new profile of Alaadeen is up at All About Jazz. *Present magazine offers a fine video of jazz poet Kemet Coleman at the Blue Room. He's backed by drummer Brandon Draper. Fans of Gil Scott-Heron will appreciate it. Additional chapters were added to the legacy of Gregory Hickman-Williams last weekend. The remarkable vocalist died in 2006, just as his career as a performer was gaining momentum. It's distressing that my review of Passages still appears to be the only one published, but renewed attention is finally bringing deserved recognition to the stunning recording. KCUR recently aired an excellent feature about Hickman-Williams. A significant portion of Kansas City's jazz community packed Jardine's on Sunday for a five-hour tribute to Hickman-Williams. Most performed selections from a list of material Hickman-Williams intended to record on future projects. Yet some of the evening's most moving moments came during pianist Pamela Baskin-Watson's accompaniment to a recording of Hickman-Williams' voice. She also played a particularly poignant version of the late Russ Long's "Save That Time." Other notable performances during the first half of the celebration included David Basse's (above, with Hickman-Williams' partner Jon Bauer) wonderfully stylized version of "Angel Eyes." Loren Pickford presented "Requiem For Gregory," a beautiful original composition. Aron Carlson, one of Hickman-Williams' students, performed an oddly affecting a capella version of "Oh My Darling, Clementine." It silenced the room, a feat Hickman-Williams accomplished in the same venue. Other notable contributors were the Sons of Brazil, bassist Bob Bowman, the Wild Women of Kansas City and Millie Edwards, who served as master of ceremonies. Bauer unveiled a mural by Kerry J. Stucky depicting Hickman-Williams' life and legacy at his home on Saturday. This panel is just a portion of the enormous work. The remarkable statement captures the spirit of an unforgettable talent. It's a drag to walk past remnants of a temporary movie set a dozen years after production shut down. Even so, that shouldn't detract from the excellence of Robert Altman's Kansas City. Plastic Sax recommends the soundtrack. The music, even in this recreation, is timeless. *Hearne Christopher quotes Jayne McShann on her plans for the Mutual Musicians Foundation in 2008. *An artist draws on the Foundation. *Read a one-time Kansas City poet's jazz-inspired efforts here. *Mr. Marco's V7 make a noirish noise that might appeal to fans of John Zorn, early Weather Report and Sonic Youth. They begin a Wednesday night residency at Davey's tonight. *Don't ask me to explain the deal with CinemaJAZZ. I don't get it. *Lee lives! Here are former Kansas Citian Lee Ingall's notes on the past year in jazz. 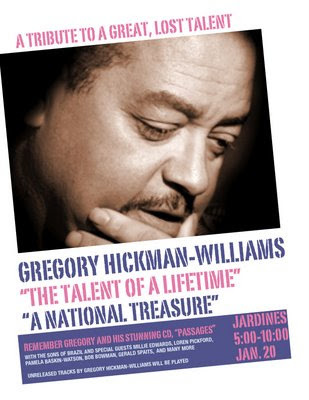 *Reminders: The tribute to Gregory Hickman-Williams is January 20 at Jardine's. And both Ahmad Jamal and Kevin Hays are at 18th & Vine on January 19. Plastic Sax knows that one of the most difficult and thankless volunteer jobs in Kansas City's jazz community is compiling a timely and comprehensive jazz calendar. 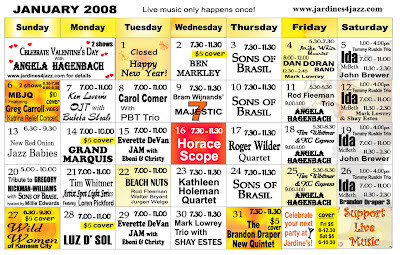 Of the approximately 200 links in the column to the right, I turn to the invaluable Jazz Ambassador's jazz calendar most often. Even though it includes listings I would omit and fails to mention shows I would include, who am I to complain? Thanks for the service, Jazz Ambassadors! There wasn't even a stage. Legendary jump blues man Eddie "Cleanhead" Vinson and vocalist Priscilla Bowman were joined by a drummer and bassist on the floor of the Grand Emporium. It was my first time inside the joint, and I was certain my scrawny underage hide would be kicked out. But in the early '80s the Grand Emporium was still known as a skid row bar for day drunks, and none of the dozen people in the smoky room gave me a second glance. The things I heard and witnessed that night changed my life. 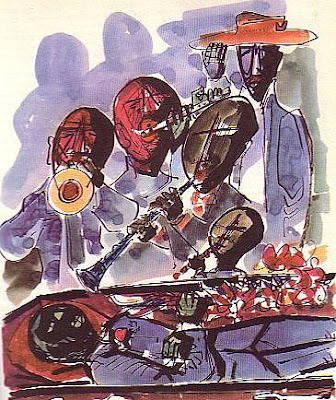 *NPR is streaming a New Year's Eve concert by the Count Basie Orchestra. 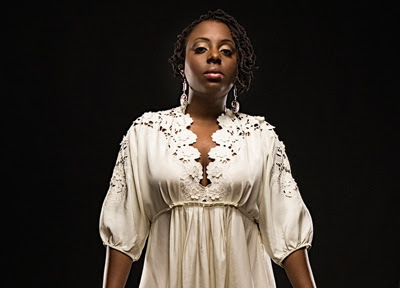 Contemporary R&B vocalist Ledisi sits in. She sounds great. *Steve Penn wrote an interesting piece about the contributions of the Coda Jazz Fund. *A nice recap of the past year in jazz is provided by Joe Klopus. *The Columbia Tribune offers a human-interest story about Reunion Jazz, a regional Dixieland band. It's almost a criminal offense that the opening of 2008 finds 18th & Vine so barren. But what remains is pure gold. And as I've written previously, it's the best place to start a weekend in Kansas City. Bouncing between the Mutual Musicians Foundation's weekly "Rush Hour" and the Blue Room's "Indigo Hour" remains one of my favorite pastimes. Drinks are cheap and the music can be top-notch. This last Friday, an ensemble of crusty old veterans working under the misleading name Smooth Groove delighted friends and family at the Foundation. Everyone who appreciates the Scamps should be all about these guys. A very different scene took place at the Blue Room just around the corner. A younger and more fashionable audience enjoyed mild jazz fusion from the BMW Band. The persistent memory of empty seats at Dee Dee Bridgewater's stunning 2007 performance at the Gem Theater still rattles me. Plenty of tickets remain for Ahmad Jamal's January 19 date at the same small venue. I'd like to see that change. This recent footage from a French festival shows that Jamal has evolved into a surprisingly aggressive pianist. His current work is significantly different than his most popular recordings. I'd be lying if I claimed that I wouldn't prefer Jamal play in this "cocktail jazz" format, or better yet, hear him revive his funk fusion sound. Even so, Kansas Citians have a chance to see a 77-year-old jazz giant in an intimate setting on January 19. These French fans would happily pay significantly more than $40 for that opportunity. Labels: Ahmad Jamal, Gem Theater, Is Kansas City Really a Jazz Town? *I concur with Joe Klopus' strident editorializing about the precarious state of jazz in Kansas City. *The Star recently echoed my enthusiasm for the Friday "Rush Hour" sessions at the Mutual Musicians Foundation. Let's hope the story will stimulate attendance. As I write this note, however, the performers for January are not yet posted. *There Stands the Glass is an impeccable and deliriously exciting MP3 blog based in the Kansas City area. It recently conducted a fine interview with Julian Waterfall Pollack, a teenage jazz pianist who in many respects represents the future of jazz. *Plastic Sax recommends subscribing to the American Jazz Museum's newsletter. Sign up for the free service by sending an e-mail to signmeup@kcjazz.org. Type "subscribe" in the subject line.